It is what a sport-utility truck ought to be — a truck with an emphasis on utility . . . and versatility. I did not understand the Chevrolet Avalanche at first. Like many Washington careerists, I thought it was another example of misplaced Detroit bravado, an attempt to answer a question no one asked with a big truck that could be transformed from a plush, full-size sport-utility vehicle into a fully capable pickup truck with a long cargo bed (8 feet, 2 inches) in an instant. Back in 2002, when the Avalanche was introduced, I thought it was the dumbest of recent dumb moves by General Motors. Washington was hounding Detroit for smaller, more fuel-efficient vehicles. Detroit, as usual, was resisting. The Avalanche, a huge truck aggressive in name and stance, seemed Detroit’s petulant answer — the mechanical equivalent of a teenager dissing a parent. Detroit, represented by the Chevrolet Division of General Motors in this case, was right. Washington, our governmental parent, did not know what it was talking about. I was wrong, too. Truth is that the Chevrolet Avalanche makes perfect sense. But you have to live with it in its intended use environment to figure that out. “Intended use environment” refers to any place outside of Washington where people work and get dirty — as in the accumulation of organic dirt on bodies and clothing — for a living. I mostly used the 2011 Chevrolet Avalanche in Orange County, New York — a place of farms, lovely mountains and beautiful valleys, where people rise early and work hard and late putting things in and pulling things out of the ground. There’s lots of hauling to and from going on, which means that Orange County largely is a truck county, a place where people use trucks as much as they drive them. There is a notable difference between “use” and “drive.” You can drive anything that will get you from one point to another. But you can’t use anything the way you can use a truck; and you can’t use any truck the way you can use a Chevrolet Avalanche. In SUV mode, the Chevrolet Avalanche offers ample cargo space. But, hey, lower that 60/40, split-folding rear bench seat. Next, lower the GM-patented Midgate. Store the rear window in the Midgate. Wow! You now have a full-size pickup truck with a protected cargo bed stretching more than eight feet! After a day’s work, when it was time to grab dinner or take in a movie in the nearby New York communities of Poughkeepsie or Fishkill, it was easy to transform the Chevrolet Avalanche back into an attractive SUV. It’s an easy drive, too. You can’t take it around curves the way you would a sports car. 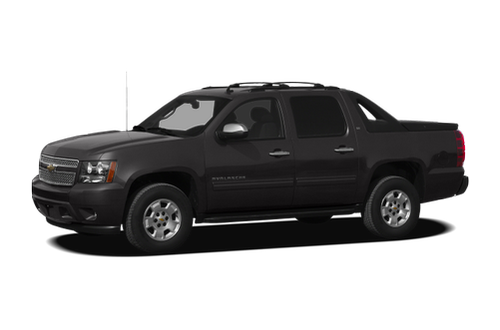 The Chevrolet Avalanche has a curb weight of 5,840 pounds, after all. But with a 5.3-liter V-8 gasoline engine (320 horsepower, 335 foot-pounds of torque), it has enough power to move that weight with authority. The power-assisted steering works nicely. The suspension work (short arm/long arm front, independent with a multi-link arrangement in the rear with rear stabilizer bar) is up to the task of dealing with heavy loads on curvy roads. And when those roads change from paved to “unimproved,” as they often do in much of the country, the Chevrolet Avalanche’s optional, on-demand four-wheel-drive system works exceptionally well. But outside of its intended use environment, say in midtown Manhattan, the Avalanche becomes an albatross. More than 18 feet long and standing nearly 6 feet, 5 inches, it’s simply too big for those congested spaces. In such environments, it moves slowly with a cumbersome gait, blocking the forward view of motorists behind you, making them angry and encouraging them to engage in dangerous driving maneuvers to get out of your way. That, I think, is why Washington and other large metropolitan areas, other than possibly Dallas and Houston, do not understand the Chevrolet Avalanche. It’s a big truck with a large footprint that gets in the way of city people with lots to do. Their angst in its presence is understandable. But the Chevrolet Avalanche makes perfect sense in the rest of the country, which happens to be most of the country, where it has been selling well since 2002. After using it for a week in that part of the country, I now know why that’s understandable, too.